Today’s 21st century arts professionals have to do more than simply keep up with or embrace change. Instead, change must be anticipated, sought out, and invested in, or else we risk a decline in relevance, left behind by rising competitors. The explosive growth of social media and digital marketing—and their effect on how we live and work—has expanded our possibilities and made our jobs more exciting than ever before. 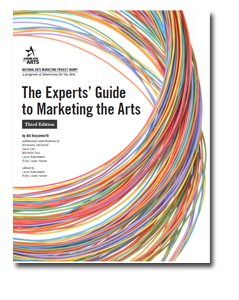 With new trends came the need for a third edition of The Experts’ Guide to Marketing the Arts . The third edition of this guide provides you with the relevant tools to develop an effective marketing strategy, attract new audiences, and increase participation and revenue. Download PDF online from My Transactions after purchase.